RGP stands for rigid gas permeable, a newer generation of contact lenses that have replaced the old-fashioned hard lenses. They are available in a variety of plastics, usually, silicone based, which transmit oxygen and carbon dioxide: hence, the term gas permeable. This is important from an eye health standpoint because the cornea is the only external tissue in your body that must derive its oxygen supply from the atmosphere. These RGP lenses give us another option to successfully fit patients who are unable to achieve satisfactory results with soft disposable lenses. Because of their rigidity, these lenses often provide clear vision for patients who could not obtain satisfactory vision with glasses or soft contact lenses: for example, those patients with a great deal of astigmatism or those who have had a corneal transplant. 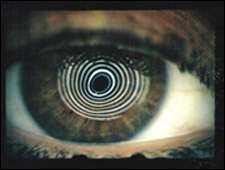 RGP lenses are also the lens of choice for those who have keratoconus. The fitting properties of a lens are determined by several factors including lens curvature, diameter, and power. The all-important factor is that the lenses must fit well enough to center properly but not so tightly that an adequate oxygen supply to the cornea is prevented. Considerable professional judgment is required for proper contact lens fitting and related follow-up eye care. Frequently, a lens must be worn several weeks to determine if the oxygen supply is sufficient and the eye is adapting properly. This follow-up evaluation is critical to the long-term health of your eyes and can only be made by a trained professional. In addition to the initial fitting, we will give you thorough instructions on lens care and handling. This is something patients are frequently concerned about but is easily mastered with a little practice. The cleaning procedures are simple and will be explained and demonstrated during an instruction session with one of our staff members. If for some reason you need additional help, we will keep scheduling additional instruction sessions at no additional charge until you feel comfortable and competent. 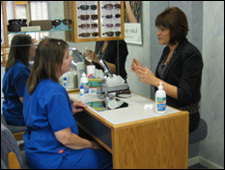 We also provide the most important ingredient for long-term success with contact lenses -- on-going professional care. Contact lenses must be monitored on a regular basis to ensure that your corneas are healthy and the lenses are fitting properly. 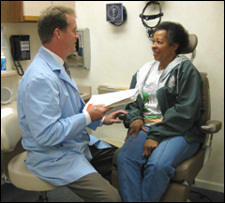 The number of follow-up visits may vary due to the complexity of the case. 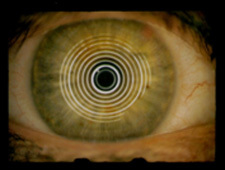 Patient wearing a RGP lens. Notice the white scar at the edge of the lens and beyond at 9:00. This is caused by excessive drying. This patient needed to be refit into a high-oxygen, soft disposable lens to cover the area to prevent further drying and scarring. Proper follow-up care is so important to safe, comfortable contact lens wear. A thorough history rules out any pre-existing conditions that prohibit wearing lenses, such as allergies, sinus conditions, medications, and work or home environment (dryness, dust etc). 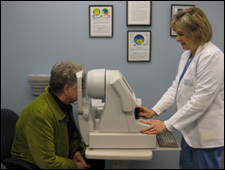 The computer verifies your prescription so we can provide you with the clearest vision possible. It also minimizes and, in some cases, eliminates the need to ask "Which is better, one or two?" 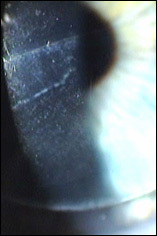 The slit lamp documents and monitors any existing conditions that would prevent successful wear. It enables us to monitor the unwanted growth of blood vessels and to check for any corneal inflammation. 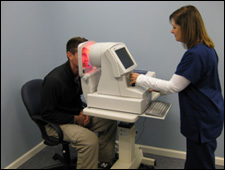 Tear testing ensures the proper quality and quantity of tears are available to provide comfortable lens wear. Corneal topography, using one of our higher tech instruments, maps out the shape of the eye. It enables us to accurately design the shape, size, and curvature of the contact lens. It detects any unwanted distortions or warpage which would indicate a lens change. What your contact lens options are. What your chances of success may be. What your expectations should be. 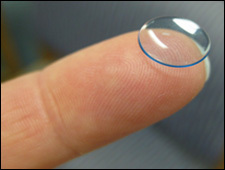 After being thoroughly informed, WE will decide together whether contact lenses are the option you would wish to pursue. While definitely exceeding the hard lens in wearing time, oxygen permeable lenses do not offer the initial "no feel" comfort of soft disposable lenses. The general adjustment period will last two to four weeks, depending on individual sensitivity. However, 5 to 10 percent of patients never fully adapt to wearing RGP lenses comfortably. Although there is not a specific scientific study, trends and past experience have shown that RGP's can slow up the progression of nearsightedness in some patients. Infections with all types of contact lenses rarely develop when proper procedures are followed. However, a limited number of patients who are prone to developing an infection with soft lenses can be fitted with RPG to solve the problem. Motivation is your desire to wear lenses and your willingness to go through the normal adaptation period. This includes adjusting to not wearing glasses, as well as adapting to contact lenses. 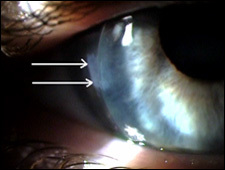 The Right Type Eyes must have the proper physical characteristics in terms of corneal curvature and lens prescription. All patients are carefully evaluated before contact lenses are recommended. 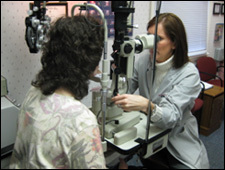 A Good Fit, simply put, is dependent on the clinical expertise of your eye doctor. Your Cooperation means you must adhere to the prescribed wearing schedules, lens handling techniques, and cleaning procedures. Notice the distorted, out-of-round rings on the right photo. This was the result of wearing a poorly fitting contact lens. 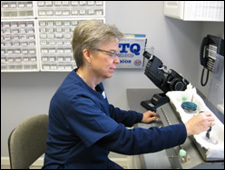 We are one of the only offices in the Chicago area with an in-house modification and polishing contact lens lab. This gives us the ability to polish or adjust your RGP lens immediately. Diane polishing a contact lens while the patient waits. Contact lens wear can be hindered by many factors, including one that is often overlooked: eye makeup. Here are a few tips that can lead to more successful contact lens wear. Avoid using hair sprays and spray deodorant as the spray may go into your eyes. Use only water-based mascara and eye makeup remover labeled as hypoallergenic or for sensitive eyes. Avoid waterproof mascara as it contains mineral spirits and petroleum distillates which are irritating. Choose cream eyeshadows because they do not create particle fallout like powdered shadows. Put your contact lenses in before applying cosmetics to avoid picking up makeup residue. Never apply eyeliner to the inner eyelid margins as it can cause pore blockage. Soft crayon-type pencil liners are less apt to cause flaking than liquids. Carefully select makeup remover. A water-based product will help avoid the accumulation of grease around the eye and do an excellent job of thoroughly removing water-based mascara. For more makeup tips for contact lens wearers, click here. Wash your hands immediately before handling lenses with non-cream dish soap. Usually, any dish soap that has color is good. Rinse your hands off until they are “squeaky” clean. Rinse the lens off in water and wash it with the same soap, rubbing lightly between your fingers. Try to create some lather. Rinse the lenses off while continually, lightly rubbing them with water until they feel "squeaky" clean. Take 5-10 drops of the conditioning solution, and rub the solution onto the lenses for about 20 seconds. Place the lens in your eye, or lightly run it under water (1-2 seconds) before placing it into the eye. If it still fogs, repeat all the steps except rubbing in more conditioning solution. If it still fogs, bring the lens in to be professionally polished.